Choose your favourite way to book an appointment. 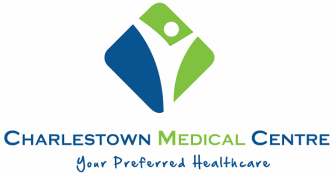 We accept online requests for repeat prescriptions only from those patients who are already registered and attending a doctor at Charlestown Medical Centre. Your prescription request will be analysed by the prescribing doctor who may or not issue it for you (depending on your current health status). The receptionists will get in contact with you as soon a decision has been made and will also advise you when your prescription is ready for collection. All prescriptions requested online will be available for collection from the reception desk at Charlestown Medical Centre. In case you need to see a GP from 7:30pm to 8:00am or on Saturdays and Sundays outside the surgery opening hours and for a serious health problem that, in your own opinion, cannot wait until the next day, please call Doctor on Duty (former Mediserve) at 01-420 0880 (details at https://www.doctoronduty.ie/). If your medical condition requires immediate attention, please attend your nearest Emergency Department. the most complete way to book an appointment is by using the Appointment Forms below; it gives the health professional a better insight of your current health status (if you are a new patient) and it saves time during the consultation; our receptionists will get back to you as soon as possible to confirm the appointment (if during the opening hours). a text message requesting an appointment should contain your full name, your date of birth, the preferred date and time for the appointment; our receptionists will get back to you as soon as possible to confirm the appointment (if during the opening hours). writing an email message to request an appointment should follow the same guidelines recommended in case of a text message (SMS); you will be contacted by our receptionists as soon as possible to confirm the booking (if during the opening hours). Should you prefer to be contacted in a specific way (text message/email/telephone) don't forget to mention it and please include the necessary contact details in your message. In case you will not be able to attend your consultation in time or at all, please advise this to the receptionists by phone/text message/email at least 1 hour in advance; failure to do so will possibly result in a charge of €20 (we are trying to avoid not being able to offer the respective consultation to an other patient who might need it as well). An appointment with the GP or Nurse is usually allocated 10 - 15 minutes and 20 - 45 minutes with the Dentist. If you would like to bring other family members with you for a consultation, each of them should be individually booked-in in advance, too. When you arrive for your consultation, please notify your presence to the receptionist at the reception desk. Please be aware that any inappropriate behaviour (verbal and/or physical aggressivity, injurious vocabulary, ebrious or post illegal drugs ingestion states, leaving without paying, a.s.o.) within the premises of the medical & dental centre will result in the immediate and permanent removal of the respective patient from our lists/panels and the case will be reported to An Garda Siochana and the H.S.E. (when applicable). Please, write your phone number if you would like us to contact you by phone. Thank you. (Note: we will not be able to get in touch with you if you leave both Phone number and Email boxes blank). Please, write your email if you would like us to contact you by email. Thank you. (Note: we will not be able to get in touch with you if you leave both Phone number and Email boxes blank). Please check one of the boxes below according to your current situation. Thank you. Please click the circle in front of the health professional you are looking to get an appointment with. Thank you. Please select the next day of the week for your appointment. Thank you. Please, check your preferred way of being contacted by us regarding your appointment request. Thank you. Please note that all fields marked with an asterisk (*) are compulsory (as they speed up the booking process). We need your date of birth to enable us to identify you correctly in our medical/dental software. Thank you for your understanding. Please complete this box if you have changed your phone number recently or if you consider we might have a wrong one. By filling in this box you confirm that we may contact you by phone regarding this request. Thank you. Please, write your email address in case you have changed your email address and you have a new one at present. By filling in this box you confirm you accept being contacted by email regarding this request. Thank you. You may write here your comments regarding this appointment request. Thank you. Please make your selection from the drop-down menu according to your preferences. Thank you. We are constantly endeavoring to improve your entire experience with us, to keep the pace with your expectations and justify that our services are "your preferred healthcare". As booking your appointment is part of that experience, we would be grateful if you could help us to improve by sharing your own opinions and suggestions with us. The evening hours for Nurse have changed! Please note that Lisa (our Nurse) is now offering evening hours for Childhood immunisations and Smear tests on every Tuesday from 2:30pm to 7:30pm, instead of Thursday evening.